There are many great reasons to purchase a mattress topper for your bed. Even if you spent hours researching and shopping around to find the best possible mattress, you may still want a little extra comfort. Or maybe you have a mattress that’s a few years old and is getting worn, but you’re not quite ready to replace it yet. A mattress topper is an easy and inexpensive way to upgrade your existing mattress without the expense and hassle of shopping for a brand new mattress. Shopping for a mattress topper can be just as challenging as shopping for the mattress itself. There are many different factors to consider, from the type of material to the thickness of the mattress topper and the price. In this article, we’ll go over all your choices and help you figure out exactly which mattress topper is right for you. When selecting a mattress topper, you’ll find there are several different materials that mattress toppers are typically made of. Each has their pros and cons and is suited for different purposes. 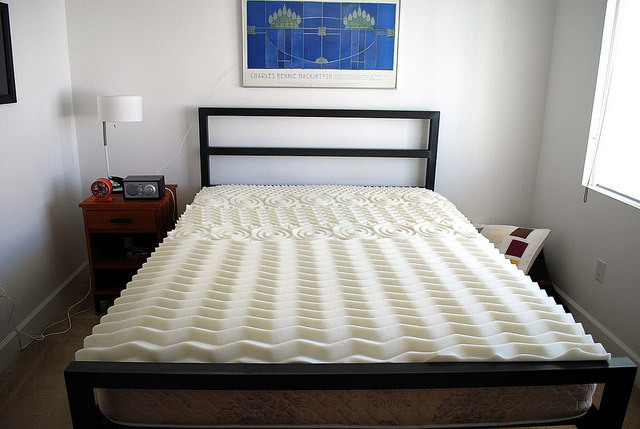 Foam mattress toppers are the most commonly available. They’re inexpensive and provide extra comfort as you sleep, but don’t give quite the same support as a memory foam mattress topper. Memory foam is an upgrade on traditional foam mattress toppers. Memory foam conforms to the shape of your body and provides even more support than ordinary foam mattress toppers. A memory foam mattress topper is a great choice if you love the comfort of a memory foam mattress but not the high price. Gel memory foam is the latest innovation in memory foam technology. It gives you all the support and comfort of memory foam, plus gel memory foam helps to control your temperature, preventing you from getting too hot at night. Wool is another popular choice for mattress toppers. While it’s not as technologically advanced as gel or memory foam, wool can help keep you warm on cold nights. Mattress toppers come in a variety of sizes. You’ll have to select a mattress topper that fits your mattress, but you can choose from a variety of thicknesses for your mattress topper.Sizes generally range from roughly 1.5 inches and can go up to 4.5 inches. A thinner mattress topper may not provide as much comfort; however, it is less expensive. Additionally, if your mattress is a higher quality mattress, you may not need a larger mattress topper. For example, if you have a firm mattress, putting a thicker mattress topper on top may make it too soft. A thicker mattress topper is great for an older or less comfortable mattress. Thicker mattress toppers add greater support and comfort. Typically, memory foam or gel memory foam come in these thicker sizes and can give you the feel of a memory foam mattress without the high price tag. Price is also important to consider when shopping for a mattress topper. If you’ve already spent a considerable amount on your mattress, you don’t want to pay hundreds for a mattress topper. On the other hand, the right mattress topper can protect your investment. Typically, the cheapest mattress toppers are thinner and don’t have as much padding or support. Certain types of material tend to be cheaper as well. Mattress toppers filled with cotton, for example, are much cheaper than gel or memory foam mattress toppers. A more expensive mattress topper is usually higher quality, but they can get pretty pricey. Some mattress toppers run a couple hundred dollars. These can be worth it, however. Mattress toppers with certain features will usually cost more. Mattress toppers that help to control your body temperature or support your back will be more expensive. These will significantly improve your quality of sleep, and can help extend the life of your mattress if your mattress is worn out.